Tim Hortons has only served lattes made from espresso powder thus far, except for limited market testing. Starting today, Wednesday April 26 they have upped their java game and are starting to serve freshly ground espresso bean lattes at nearly all of its restaurants! 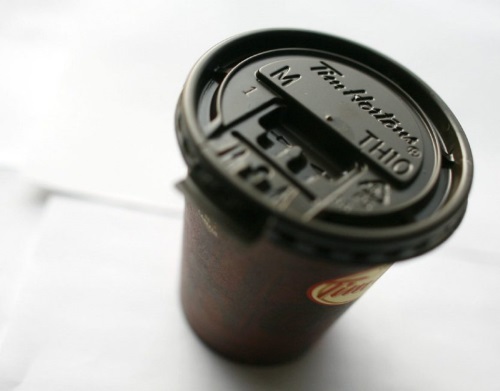 The head of marketing for Tim Hortons in Canada says it recently outfitted more than 3,500 of its more than 4,600 restaurants with espresso machines in an effort to offer a more premium product and appeal to new customers. According to market research firm NPD Group, Tim Hortons dominates the coffee market in Canada, an industry worth roughly $3 billion a year, not including coffee consumed at home. These lattes will be sold for $2.99 at participating Tim Hortons nationwide. Click here for The Star news article.